Marriage may convey the message ‘I own you’ but Paul Essiembre as Torvald (left) and Deborah Hay as Nora (right) address double standards making audiences sit up straight and pay attention. 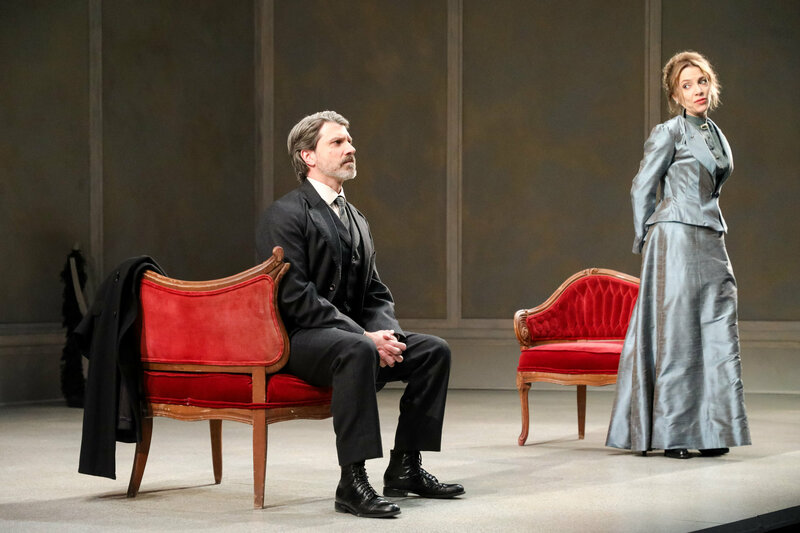 A Doll’s House, Part 2 plays the CAA Theatre until April 14, 2019. Women. The majority of men love them with all their heart but for better or for worse they can be so challenging to deal with when pursing a personal agenda. Audiences new that in Henrik Ibsen’s A Doll’s House which garnered international praise for its classic story sculpting since its debut in 1879. Lucas Hnath’s ‘what if’ follow-up examines the interchange between estranged wife Nora (Deborah Hay) and heartbroken hubby of the past Torvald (Paul Essiembre). He makes crystal clear points inspiring the right thing to do next crystal clear with the help of housekeeper, Anne-Marie (Kate Hennig), and daughter, Emmy (Bahareh Yaraghi). A Doll’s House, Part 2, a dramatic foundation of excellence, picks up where the original left off. However, this is now 15 years later and the relationships left behind are in absolutely no shape to expect any favours. The issue? Nora has established herself as a successful novelist driving home the message for women to leave their marriage if they are not happy. The problem? She was under the impression she was legally divorced but conflicted Torvald never got around to it which begs the question, will he do so now upon request? ‘A wound has to be allowed to heal,’ insists Nora. Maybe so but that doesn’t make matters any less complicated. This succulent staging entrusts a dazzling minimalist set to set expectations with director straightens out feminist issues with a fine tooth comb during this time when women had no rights. Marriage is about self-sacirfice but that’s often a realization that dawns on a person until it’s far too late in the game. With communication being a relationship’s second definitive battle, you can’t help but appreciate the concept of freedom and independence in A Doll’s House, Part 2 without getting caught up in the emotional gap it can create. And that’s a good thing, not a bad thing. DOLL’S HOUSE, PART 2 by Lucas Hnath CAA THEATRE, 651 Yonge Street, Toronto DATES March 23 – April 14 2019 TICKETS $39.00-$99.00 www.mirvish.com 416-872-1212 CAST Deborah Hay, Kate Hennig, Paul Essiembre, Bahareh Yaraghi DIRECTOR Krista Jackson SET AND COSTUMES Teresa Przybylski LIGHTING Michael Walton SOUND DESIGN Michael Wright STAGE MANAGER leslie Watson ASSISTANT STAGE MANAGER Katherine McDermott.